Naomi Seberg and Nathan Math are a globetrotting couple of freelance photojournalists tracking down weird stories in the realms of medical technology, crime and academia. They stumble upon what might be the scoop of their lives when they come into the orbit of Celestine and Aristide Arosteguy, neo-Marxist philosophers of commodity fetishism who are household names in their native France. When Celestine’s body is found horribly mutilated, some parts even eaten, and Aristide flown the coop, Naomi sets off to track him down in his last-known whereabouts in Tokyo. Meanwhile, after investigating an unorthodox eastern European breast doctor, Nathan finds himself with a bad case of Roiphe’s disease, a sexually transmitted infection that he decides to investigate by going to meet the physician whose name it bears. While at first these two stories don’t seem to have a lot in common, eventually Nathan and Naomi peel back the layers to uncover a strange psycho-sexual conspiracy that criss-crosses the globe. 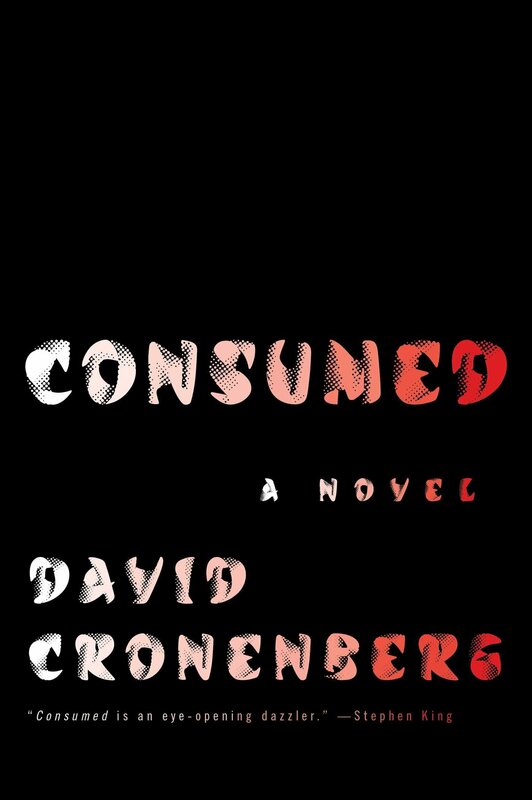 Consumed is the first novel from David Cronenberg, the Canadian filmmaker whose works include such classics as Videodrome, The Dead Zone, A History of Violence, and Crash, among many others. As such, the publication of this book caused a minor stir in Canadian literary circles, eventually netting the author the front page of Quill and Quire magazine in addition to reviews, interviews and retrospectives in basically every major publication. I wish I could say I liked this book more, but it was a real disappointment. Cronenberg’s keen eye for human fraily and body horror (something he basically invented) are certainly on display in Consumed, but unfortunately these concepts are tied to some of the least interesting and stock characters I’ve read lately. Naomi and Nathan are almost interchangeably dull, with journalistic and sexual ethics that they abandon at the drop of a hat, and a curious fetishization of cameras and other tech that wears incredibly thin while reading. Now, two seemingly bland characters either being parts of a whole, or merging together somehow is a big part of many of Cronenberg’s films, like the twin gynecologists found in Dead Ringers, Seth Brundle and a housefly in The Fly. The inverse can be found with the almost split personality of Tom Stall, Viggo Mortensen’s character in A History of Violence. So I’m sure these two ciphers we’re saddled with throughout the course of the novel were created with this in mind, but there’s a big difference between watching a movie with a boring half-character and reading a book, inhabiting their thoughts. As I noted above, and in the quotation that begins this review, I’m sure the ad nauseam recitings of different camera settings, cell phone purchases and photo editing software found throughout the novel are supposed to say something about Nathan and Naomi, but whatever the message is, the medium through which it’s delivered is deadly dull (shout out to Professor Brian O’Blivion on that one). Speaking of O’Blivion, as a respite from Nathan and Naomi’s fawning over whatever they last bought at an airport kiosk, we do get two mad scientist characters, a classic archetype for Cronenberg. Aristide Arosteguy’s weird blend of commodity fetishism and plain regular fetishism is at least interesting, and a sequence in which he details the events spiralling out of a failed Cannes Film Festival judging session is probably the highlight of the book. In Toronto, Dr. Roiphe could be a second cousin to Videodrome‘s Marshall McLuhan stand in O’Blivion, or perhaps Dr. Paul Ruth, Patrick McGoohan’s kindly psychic researcher in Scanners. What is a little bit disturbing and regressive, though, is the continued degradation and transformation of every female character in the story with no equivalent male undergoing the same. I found this to be a little out of character for Cronenberg, who doesn’t usually stick to any gender bias in his body horror tales. Scanners were unisex, as were the unfortunate viewers of the Videodrome signal, and everyone got off on car crashes in Crash. The STI Nathan Math gets is hardly comparable to what happens to Naomi, or Roiphe’s daughter, and he eventually just shuffles off the stage into irrelevance anyway, so why bother? The overall effect recalls Cronenberg’s earlier exploitation flicks like Rabid or Shivers, with maybe a touch of the bad divorce story of The Brood. So, with Consumed, what we’re getting is a late-period Cronenberg work, a story that is desperately uninteresting despite its salacious subject matter. I will say that interest did pick up for me about halfway through, once we start to realize the depths of the depravity on display. I just wish I hadn’t had to read 120 pages of boring to get to what kind of ends up being a Cronenberg spin on a Tom Clancy cyberthriller, with weird character names Pynchon left sitting on a shelf somewhere.